More New Colors for 2014. 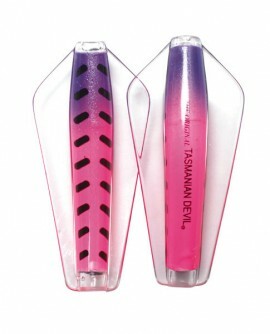 We now have the new colors just introduced in this range. See items 120-130 in the color range. For a complete color range here. 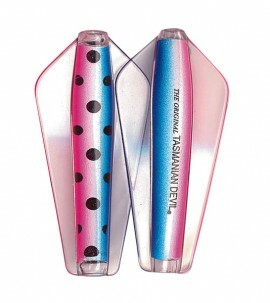 Tasmanian Devil fishing lures are a great innovation from Tasmania, Australia. Their introduction into the US has proven a great success and word is getting around concerning their catching power. A great lure. Articles on fishing Tasmanian Devil Fishing Lures. 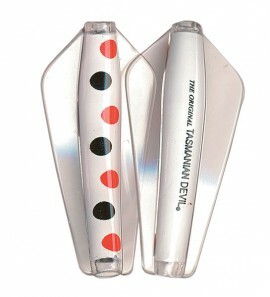 We carry the complete range of tasmanian devil lures in all colors and all sizes which are available in the USA. The lures come in 4 sizes. 7g, 13.5g, 20g and 26g. Note: That not all colors come in all sizes. 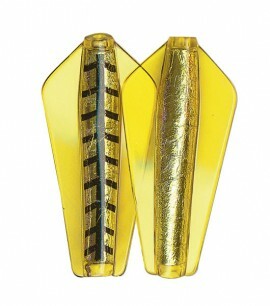 For specific pricing and sizes available go to our fishing lure store. Yellow Wings. 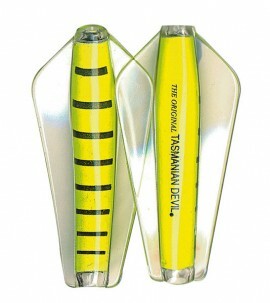 A bright colored tasmanian devil fishing lure which flashes in murky water to attract the feeding fish. 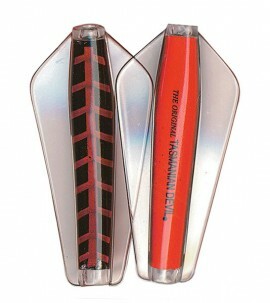 To buy this tasmanian devil fishing lure go directly to our fishing lure store. Brown Trout. Another favorite of freshwater fishermen in all sizes. 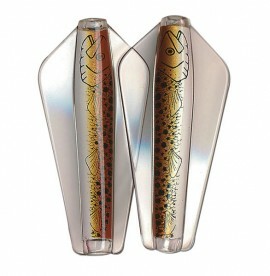 The brown trout tasmanian devil fishing lures works across the world. Rainbow Trout. A standard for most freshwater fishermen, the rainbow trout pattern tasmanian devil fishing lure works in small streams, larger rivers, lakes and ponds. 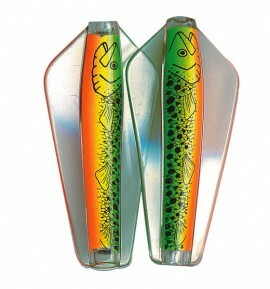 One of the top selling tasmanian devil fishing lures. Fire Tiger. Another favorite of fishermen the world over. The spotted rainbow. 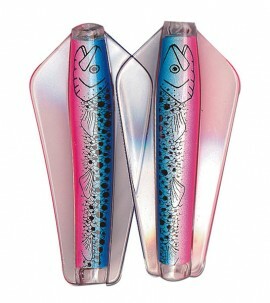 A variation on the rainbow trout tasmanian devil fishing lure with the same attracting power. The Abigail. Another favorite tasmanian devil fishing lures. Yellow hornet. Another tasmanian devil lure which stands out in colored water. Aptly name "The Clown". Another great attractor tasmanian devil fishing lure. The Black Widow. Another great tasmanian devil fishing lure. See the complete color range starting here.